RFID Library Solutions of Minneapolis, MN customizes and fabricates automated material handling and sorting solutions for libraries. RFID Library Solutions recognizes that every library is unique and should have a custom designed automated material handling (AMH) system created to fit their space, workflow, timeline and budget. With that philosophy, Eric Kohorst, President of RFID Library Solutions, searched for a conveyor company that would give RFID the flexibility needed to satisfy the unique needs of each library. Kohorst believes they found the right fit with Dynamic Conveyor of Muskegon, MI. “We were looking for something different in our supplier relationship. Not only was it important to uncover a unique conveyor design, but to find a conveyor manufacturer that held similar beliefs. Upon our first visit to their facility, we knew we had found a company with family values”, says Kohorst. A key component in every system is the DynaCon conveyance. 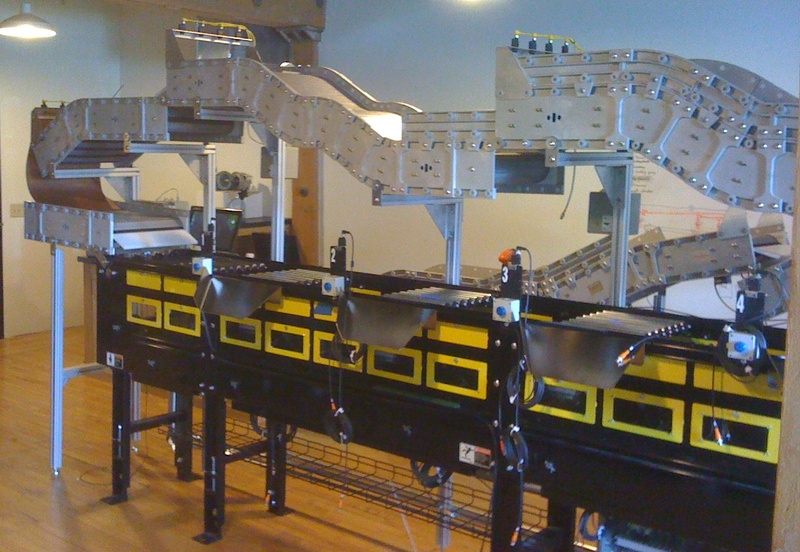 With the unique and proprietary modular sections of the DynaCon conveyors, RFID Library Solutions can design, build and install library material handling systems (AMH) that accept patron returns; separate the items while transporting them to the circulation rooms; and finally sort the items into categorized bins using RFID technology. 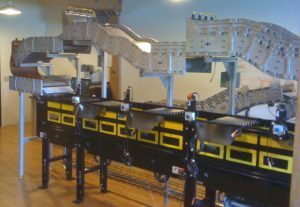 Jamming of library materials between conveyor transfers is a problem that typically occurs with traditional systems, which include band and loop style conveyors. Utilizing DynaCon conveyors in their AMH systems, RFID Library Solutions has eliminated this issue for their library customers. Libraries have seen an increase in their efficiencies with the RFID Library Solutions system by aiding in re-circulating items faster. With a RFID Library Solution system in place, it’s typical for books and media items to be checked-in immediately, sorted within minutes, and put back on the shelf or routed to ‘Holds’ for a patron. Increasing efficiencies during materials check-in and sorting tasks allows library staff to focus more time on their customer service oriented responsibilities. “With the help of partnerships like Dynamic Conveyor, we are able to offer features and capabilities that are new to the library AMH movement,” explains Kohorst. RFID Library Solutions offers customized library material handling systems that compete with traditional systems. Although traditional systems have worked successfully in the industry for years, they don’t offer the system flexibility that is needed since each library, its process and available space is unique. RFID Library Solutions starts by listening to their customer first, and then designing a custom solution for their very specific needs to actually solve their circulation bottlenecks. “Ultimately, it’s all about giving the library a customized product they desire. Using the DynaCon conveyors we are able to accomplish this on every project. No matter what the space constraints, we always have a solution that fits their needs and stays within their budget” Kohorst says.